For people to keep doing what they’re doing, it’s always good to make them feel appreciated for their efforts. A simple thank you is often enough but throwing an appreciation dinner party is a far better way of honoring them. Here, we’ve got downloadable invitation templates that you can use for your upcoming event. Although you may be allowed to do this in the later steps, it’s actually better to start doing it early so you’ll have an estimation as to the number of copies you will need to print. Other than that, preparing a guest list will enable you to know how to address your recipients. 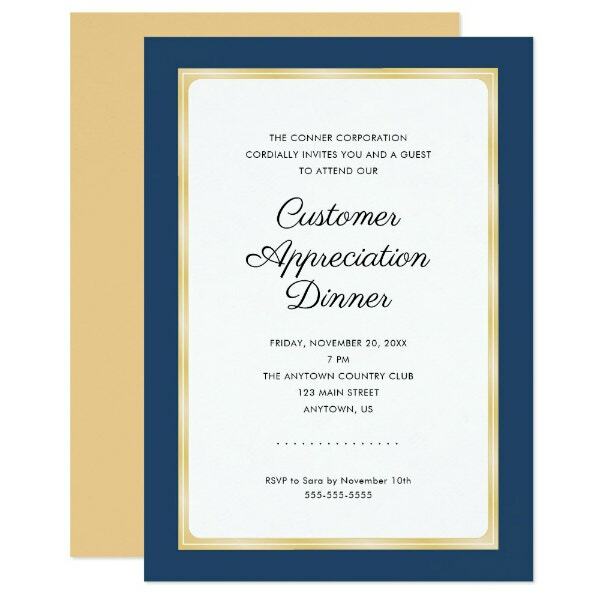 There are various types of invitations but for appreciation dinner events, a formal dinner invitation is often used. Familiarize this type of invitation, the tone of voice, and the rules applied for its elements. One example would be the writing of the date and time wherein formal invitations will require you to spell it out completely. 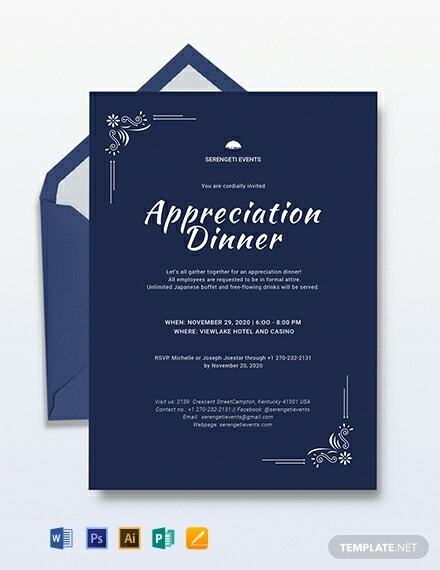 The usual contents of appreciation dinner invitations include the name of the host and the honoree who is being appreciated, the title of the event, the date and time, and the venue for the event. Because you are allowed to add more, it would be best to prepare a draft to make sure that your content won’t clutter the invitation’s layout. Instead of having to start all the way from scratch, we’ve got invitation templates below that you may use for your dinner appreciation event. These templates can be downloaded easily and they can also be edited fully with the right editing tool. Therefore, if you’re downloading an invitation template in Word, make sure to edit it using Microsoft Word. After making the necessary changes and adding the content to the invitation template, make sure that you’re providing the right information and the details are correctly spelled. This step is also known as proofreading and it serves to simply make sure that there aren’t any misspelled words or grammatical errors. The last step in the process is printing out copies of your invitation and if you’ve prepared a guest list in Step 1, you now have a clearer picture as to how many copies you will need to print. However, it’s always better to print extra copies of your event invitation just to be sure, you might need to send more at the last minute. As we have said in the introduction, realizing that your efforts have been appreciated by others is always enough to motivate you to do your best. We’re sure everyone would agree to that which is why if you’re putting together an appreciation dinner in honor of someone, you may use the event invitation template above. 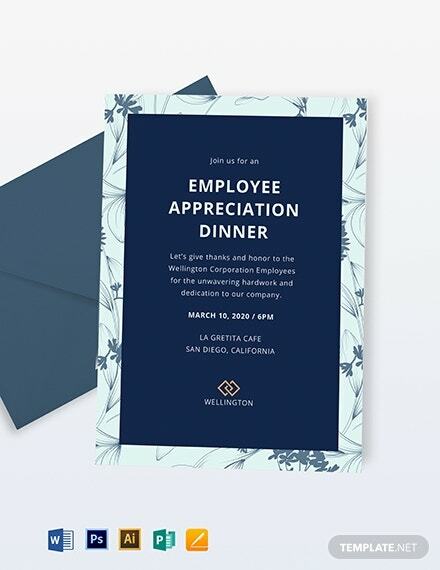 For a more specific appreciation dinner invitation, here’s a template that’s specifically designed to be used when the honoree is an employee of a company. Not all people can say that they are happy with their jobs but being appreciated by their employers would be a good start. Watercolor effects are and will always be unique in the world of designs regardless of how simple they actually are, check out the dinner invitation template above as an example. For a template with a similar style but for a different kind of event, check out our watercolor invitation template for weddings. To those who prefer simple and clean, this invitation template may be what you are looking for. This two-toned, typographic template is perfect for emphasizing your invitation’s message while keeping the design classy. Of course, this template is highly editable and you may be allowed to use it as a lunch invitation instead. There are times wherein the business person isn’t the one being appreciated but rather the client or customer. In such cases, you might find the invitation template above quite useful. As much as you can, strengthen your relationship with your customers and keep them satisfied with your services. You can always give the honoree a card and a bouquet of flowers to show your appreciation, but you can actually do both in one go. The floral dinner invitation template above is enough to hit two birds with one stone, it’s twice as meaningful and it gives more reasons for the guests to treasure the invitation even after the gathering. Serif and script fonts are often the common ingredients to formal and elegant designs and the template above is a proof to that statement. Again, our party invitation templates can all be customized easily and downloading them can be done with just a click of a button.